In this memorable crossover with the Cthulhu Mythos, the duo are called upon to investigate the death of a member of the Royal Family. And from the quick introduction to the setting - well, you can guess the victim is rather less human than he seems, and the Queen herself is taking a close interest. If you're familiar with Arthur Conan Doyle's stories, you'll get much more out of it, but as with all - well, most - of Gaiman's work, it's pretty brilliant. Some nice twists and detective work make this one of my favourite fantasy shorts. Who doesn't like a spot of Adams? Though obviously best known for The Hitchhiker's Guide to the Galaxy, Adams' other novels are - in my view - equally good! The titular agency is quite possibly the weirdest - and most amusing - example of the fantastical detective in the genre. Dirk Gently's method of detection of 'holistic' - it relies upon the 'fundamental interconnectedness of all things'. In practice, he relies on an elaborate chain of coincidence, science fiction, and plain weirdness to succeed: and it's frequently hilarious to watch his carefully constructed, entirely improbable conclusions turn out to be - well - entirely accurate. And as with all Douglas Adams, it's a great deal of fun. While lacking the conventional draws of a mystery novel - because who could jump to the right conclusions in Adams' case? - Dirk Gently has more than enough to attract any SFF reader. Honestly, who doesn't love the idea of an Electric Monk? And of course, the one long-time readers of Drying Ink will probably have guessed: The Dresden Files. Though occasionally straying from his primary occupation, our protagonist, Harry Dresden, is at heart a private investigator - especially a magical one. 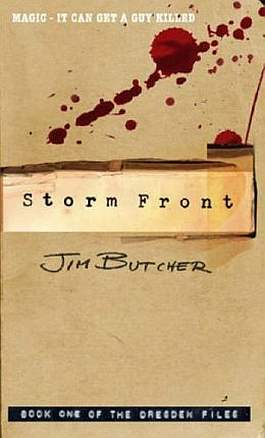 While involving at least as much action and - inevitably - magical showdown as mystery, The Dresden Files almost all begin with Harry taking on a case as an investigator. Though not always the case, mystery frequently plays the central role in the novels of The Dresden Files - this isn't a straightforward set of urban fantasies. And most of the time, that's part of the fun. Though not as unfailingly logical or deductive as some, Harry Dresden's magical methods are always rule based - meaning that the cases are far closer to conventional mysteries than my other examples. And as always, they're great fun. Well, those are mine - but feel free to tell me yours. Ooh, I need to reread that - though I loved it first time round. The Quantum Thief is one of the few genuinely fun - not just enjoyable - SF novels I've read. Haha, yep - I read a collection of Gaiman's stories once, and I have to say that I wasn't a huge fan of many. A Study in Emerald is by far Gaiman's best short fiction for me. Thanks for the info about "A Study in Emerald - Neil Gaiman". I need to check this pastiche. No problem - and I'd thoroughly recommend it. You can get it for free on Gaiman's website, if you're interested (in rather funky newsprint as well). Hmm, haven't read that, though I've enjoyed some of Horowitz's fiction in the past. i'll keep an eye open for it.